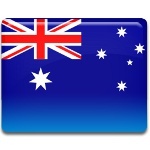 Australia Day, celebrated annually on January 26, is the official national day of Australia. It commemorates the arrival of the First Fleet of British ships at New South Wales, which led to the foundation of the first European settlement in Australia. The coast of New South Wales was discovered and claimed for Great Britain by the British explorer James Cook in 1770. Having lost its American colonies in the American Revolutionary War, the British government sent a fleet of ships to establish a new penal colony in Australia. Referred to as the First Fleet, its commander was Captain Arthur Phillip. The First Fleet departed from Portsmouth on May 13, 1787 and arrived at Botany Bay, the designated location for a British settlement, between January 18 and 20, 1788. However, it was immediately apparent that Botany Bay was unsuitable for a colony. Captain Arthur Phillip formed a party to explore the coast and find a better location for a settlement. Finally, it was decided to establish a settlement at Port Jackson. On January 26, 1788, Captain Arthur Phillip disembarked at Port Jackson and raised the Union Jack at Sydney Cove, taking possession of the land in the name of King George III. Although the Colony of New South Wales was formally established on February 7, it is January 26 that is celebrated as the colony’s anniversary and the national day of Australia. The celebration of the First Fleet’s arrival at Port Jackson dates back to at least 1808. Originally an informal affair organized by colonists, it was officially celebrated for the first time in 1818 to acknowledge the 30th anniversary of New South Wales. After that, Foundation Day continued to be an official celebration in New South Wales. Other colonies originally had their own celebrations to mark the anniversaries of their founding. However, by 1935, all Australian states adopted January 26 as Australia Day, although it was still referred to as Anniversary Day or Foundation Day in New South Wales. Participation in Australia Day has considerably increased since 1988, when Australia marked its 200th anniversary. Since 1994, all states and territories have celebrated it as a unified public holiday. Australia Day events are coordinated by the National Australia Day Council, state/territory councils and committees, and local committees. These events usually include outdoor concerts, street parties, picnics and barbecues, parades, festivals, art and literary competitions, historical re-enactments, sports competitions, and firework displays. Citizenship ceremonies are also commonly held on Australia Day. However, not all Australians support the celebration of Australia Day. Some regard the holiday as a symbol of aboriginal oppression and marginalization, referring to it as Invasion Day or Survival Day. Thousands of people participate in Australia Day protests every year, trying to raise awareness of discrimination that the indigenous people of Australia have faced over the centuries. In response, official celebrations have tried to include Indigenous Australians, holding ceremonies that celebrate their culture and legacy.